This entry was posted on Tuesday, December 4th, 2018 at 4:45 pm	and is filed under A Little Sunshine. You can follow any comments to this entry through the RSS 2.0 feed. Both comments and pings are currently closed. My issue with this scenario is that while a “Breach” didn’t occur. It most certainly looks like some accounts were accessed through a password credential guessing attack. The responsibility is on the end-user because they chose to re-use passwords. I don’t believe that Citrix bears any liability. They are clearly monitoring for suspicious login activity. This article doesn’t address that issue that some accounts were most likely accessed. Citrix isn’t going to release this information because a “Breach” didn’t occur of their systems – end user password re-use did. They reacted quickly and timely. 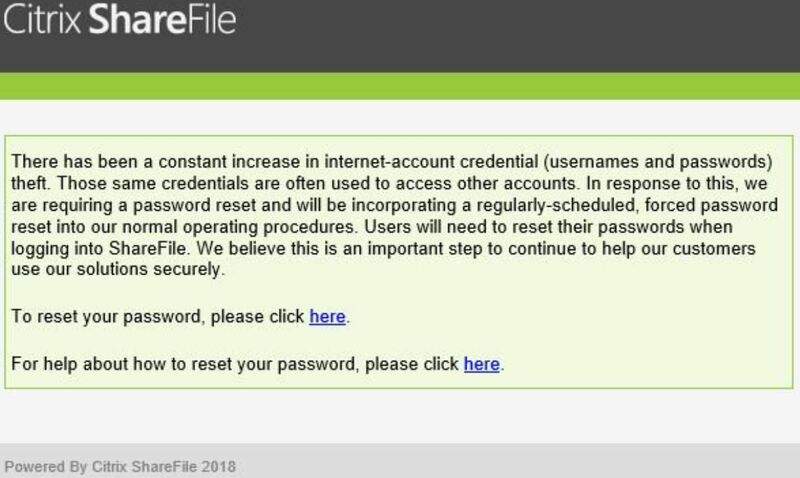 A company who has vendors that utilize Sharefile should still be contacted to determine if they were notified that their userID’s appear to have compromised. On reddit there is a sample notice that was posted that appears to be notification by Citrix that a individual account was potentially compromised. Citrix isn’t obligated to disclose this information. All vendors using this service would be responsible for data breach notification. I have sent out letters of inquiry to all the vendors I interface with that use the service. Citrix has had our report from a copy of SOPHOS installed on Android that reports site: https://secure.sharefile.com/Authentication/Login contains malicious code. They have had the report for more than 48 hours and the threat is still being reported. We have advised our clients (with urgency) to reset their password to a randomly generated password that is not used on any other sites, to enable 2FA and to inform their clients to do the same.